"It's about time the one hundred thousand or more gay people in the Maritimes had a voice to call their own. It'll be as much yours as you will contribute to it." Articles: The Lesbian Conference [in Kingston] by AnneFulton; G.A.E. News; Dangerous Sexual Offender Legislation by RobinMetcalfe; Our Heroes The Halifax Police by R. Isnor; G.A.E. And The Halifax Media by BobStout; National News; A Personal Reaction To The Cleanup by AnneFulton. Notices: TheeKlub; The AlternateBookShop; GAE Electons; GayLine; Halifax Youth Clinic; Encounter Group using Transactional Analysis and Gestalt by BobIsnor? ; Christian & Gay? Phone or write Fr. MikeMacDonald; Penpals; Soccer. 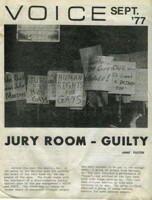 Articles: Gay People vs. CBC by RobinMetcalfe; news flash about the JuryRoom; Art - In Review by JimMacSwain; G.A.E. Visits Dal by MaryAnnMancini; MOVE by JimMcSwain; APPLE by AnneFulton; The Turret by BobStout. Notices: GayLine; AlternateBookShop; TheeKlub; G.A.E. ; Hfx Youth Clinic; LesbianCanadaLesbienne. Staff: Editor: MaryAnnMancini; Publisher: MarniDowe? ; Typist: SusanLongard? ; Voice Committee: RobinMetcalfe; DebTrask? ; AnneFulton; Contributors: JimMcSwain, RobinMetcalfe, MaryAnnMancini, AnneFulton, BobStout. Articles: Cover: JuryRoom: Guilty by AnneFulton; APPLE by AnneFulton; In The Beginning, a history article mentioning CitadelHill, ThePiccadilly and TheeClub by "A.T." (TonyTrask); Christian Or Fanatic by AnneFulton; The Turret by BobStout; Interview of JohnKyper? by RobinMetcalfe. The scans of the magazines are courtesy of RobinMetcalfe, relayed by MaryAnnMancini. information about funding - probably from GAE. This article is in the PrintMedia category.